The Self is a spiritual word for our true nature - who we are beyond the ego, body, emotions, and mind. The Self is a direct experience of our truth, the I AM. Satsang means in the company of truth. When all of life is realized as the direct experience of One Self, every moment is a satsang and a true miracle. If you have any questions, feel free to contact the channel here. 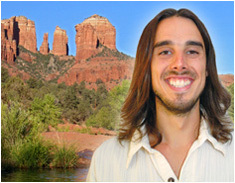 You can also visit his video blog website ChannelHigherSelf.com to learn more. If you you would like to have a personal channelling session with Lincoln, please visit ChannellingHigherSelf.com to make an appointment. Satsang with the Self is a modern day re-creation of the traditional satsang teaching enivronment using 21st century technology. Take part in a digital internet ashram, live fully interactive video streamed to you over the internet every weekend. Active participation is encouraged. These Higher Self channelling sessions are for you. The literal translation of the Sanskrit word Satsang is sat = true; sanga = company. Satsang typically involves listening to or reading spiritual teachings, reflecting on, discussing and assimilating their meaning, meditating on the source of these words, and bringing their meaning into one’s daily life. The definition of Satsang also extends to include the inner voice of guidance and teaching that is awakened within you as you develop the potentials of your Soul or Higher Self. In a world where the predominant focus of attention is 'out there', Satsang provides an environment which affirms the practice of looking within. The nature and goal of Satsang with the Self is to establish you in a direct, unbreakable communion with your Higher Self, while living an active worldly life. The word Self is derived from the Indian word Ātman (Sanskrit: आत्मन्) or Atta (Pāli): which literally means "Self" and is also translated to mean "Soul". Ātman or Atta is rooted in the Indo-European word ēt-men which means "breath". While Buddhism and Yoga (or Advaita or Vedanta) disagree about the permanence or impermanence of the Self, the fundamental definition is the same. The Self is you, at the innermost core level. As you will learn in the Satsang with the Self videos, the Self is both impermanent and permanent simultaneously. It is the nature of manifest reality to be dualistic. It is the nature of Self to be all inclusive. Satsang with the Self is the gathering of Souls to celebrate the highest truth of who we are: pure, unconditional Love Consciousness. Lincoln is a Channel for Higher Self who has been offering free internet video spiritual teachings since 2007. During his 99 day initiation into the Higher Self Consciousness, Lincoln has deepened his connection to his Inner Teacher, building a stronger bridge through which Higher Self spiritual guidance flows. While remaining in full consciousness of his body and physical surroundings, this channel is able to communicate messages from his non-physical Higher Self Consciousness or Soul. After completing 99 Days 99 Channels, Lincoln was guided to create a weekly internet Satsang that would be more interactive than his previous video projects. Satsang with the Self serves as an internet classroom where Lincoln can share the Higher Self spiritual teachings will all who desire to take part. As technology grows, so will the methods of communication and participation offered by Lincoln, a Channel for Higher Self, and creator of Satsang with the Self. In the spirit of a traditional Satsang, no fees are required and donations are welcomed. Get your own personal Channelling Higher Self session. © 2008 Channel Higher Self. All Rights Reserved.